The production of optical fiber conductors and cables requires continous heat for preheating, polymerization and sealing of the insulator, annealing, covering, etc. Because of its compact footprint and precision temperature control, induction heating equipment positioned in line is the ideal solution for these processes. One of the most commonly applications for induction heating is pre- and post-heating of cables, pipes, strips, wires and mechanical components for welding, extrusion, vulcanizing, sintering, galvanizing, painting or polyethylene coating, or some other type of coating such as Dacromet. For series manufacturing as well as for continuous production of products requiring a high quality of heating, induction offers the advantages of accuracy, speed, and high repeatability. 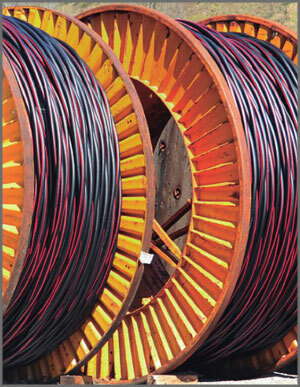 Companies that benefit from our induction heating technology include manufacturers of cable for power transmission and distribution, and manufacturers of complete systems or extrusion lines for energy cable production. Induction heating is widely used for pre- and post-heating of cable and wire.